5 Essential Ravi Shankar Recordings, From 'West Meets East' to 'West Eats Meat' : Deceptive Cadence Ravi Shankar was not just an ambassador for Indian culture. He was an intrepid musical explorer who as a teenager heard Cab Calloway and who created collaborations with artists ranging from George Harrison to Yehudi Menuhin to Philip Glass. Hear five Shankar collaborations you must know. The late sitarist, composer and musical ambassador Ravi Shankar, who died Tuesday at age 92. In certain circles, the echoes of the late sitarist and composer Ravi Shankar's talent are everywhere — and not just in the places you might expect. 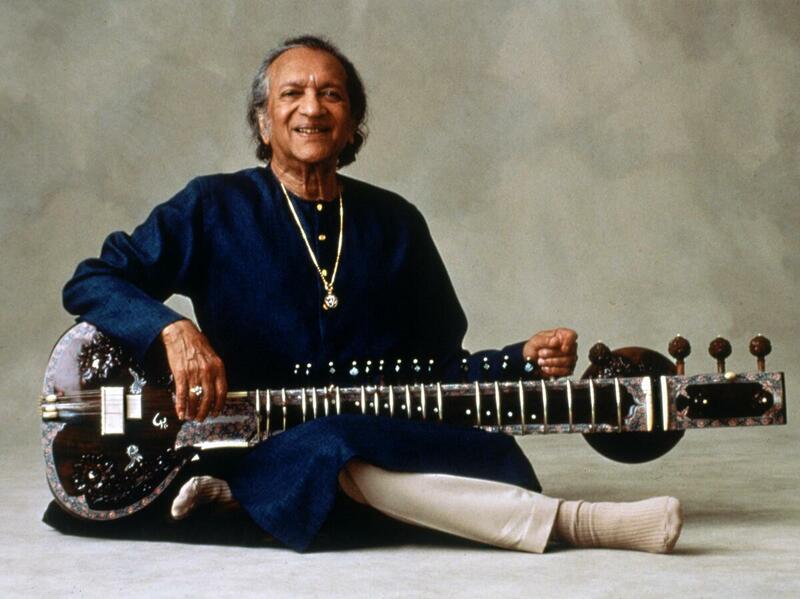 Moreover, lots of folks around the world won't know other Indian instruments like a bansuri flute or a sarod or a sarangi, but they can instantly identify the sitar's sound — and that's entirely thanks to Ravi Shankar. Twenty years ago, when I first fell entirely accidentally into the world of South Asian music — which then became a long-standing passion of mine — the only Indian musician's name I knew was his. Back then, I couldn't possibly have foreseen having had the chance of working with him for a short time about a decade later, when I was asked to put together a retrospective compilation of some of his most notable experimental work. He was a warm and gracious presence, and seemed intrigued by how I had stumbled into Indian classical music. "But you're Greek!" he exclaimed. Well, yes — but as for so many others, I was lucky enough to have experienced his music as a portal into this whole other world. Shankar became the world's foremost ambassador of Indian music and culture, but he couldn't be all things to all people. There have been many other astoundingly talented sitarists who were either contemporaries of Shankar or younger, among them Nikhil Banerjee, Vilayat Khan and his son Shujaat Husain Khan, but none of them ever became household names the way Shankar did. He was a spokesperson for the North Indian tradition, which only tells half the story of Indian classical music. And critics and connoisseurs sometimes derided the way that Shankar reshaped centuries-old tradition into easily digestable bites — turning ragas that traditionally would unfurl over the course of an hour or much more into ditties — ragettes, maybe? — that alaap to jhala lasted maybe 10 minutes in all. Yet no other artist caught the fire of popular imagination the way that Shankar managed, or knew how to connect to Western audiences the way he did. After all, this was someone who moved to Paris at age 10 and when he was about 13 saw Cab Calloway play the Cotton Club in Harlem, and whose artistic family was admired by such world-class aesthetes as James Joyce and Anna Pavlova. Perhaps no one else was as willing to continue to evangelize about Indian classical music throughout his life. Even well into his 80s, Shankar patiently gave performances and explanations that traced the basic outlines of Indian classical theory — which many master musicians of any style would find far beneath them. And Shankar passionately explored all kinds of musical streams with an amazing group of collaborators, creating a global network of kindred spirits that bore tremendous riches. Shankar first heard Yehudi Menuhin play in Paris when he was 11 and the violinist was barely 15, but it was not until two decades later that they really met and then began to play together, an encounter which Menuhin recalled in Shankar's 1997 book Raga Mala as "unforgettable" and "a music-making that I could have only dreamt of." They began performing together in 1966. 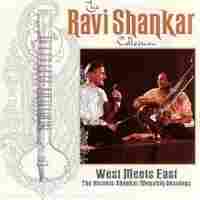 In short order, a first recording emerged: West Meets East, which included an intoxicatingly sweet duet for sitar and violin called "Swara-Kakali." Despite the North Indian tradition's emphasis on rhythm and melody as its two fundamental components, the tabla drummer has traditionally taken second place to the soloist in performances. But Ravi Shankar sometimes put his great drumming collaborators center stage, such as in this memorable solo in ektal (a 12-beat rhythmic cycle) by percussionist Alla Rakha. It's not a cross-cultural collaboration but a profound and exciting partnership between equals. Along with being one of the greatest drummers of the 20th century in his own right, Alla Rakha was the father of another genre-smashing Indian musician: percussionist Zakir Hussain. Shankar released three cross-cultural projects on the Private Music label, including 1987's Tana Mana — in which Shankar combined traditional instruments with electronic instruments and sampling keyboards, and which also features George Harrison on autoharp and synthesizer. I had the privilege and pleasure of working with Shankar to produce a retrospective album of his work from this period. I named it Setu (or "Bridges" in English), which seemed very fitting. The most playful track in the collection is from Tara Mana; in a sly nod, it's called "West Eats Meat." The Setu retrospective also includes selections form 1990's Passages, a collaboration with composer Philip Glass. The idea behind Passages was that Shankar and Glass would each compose themes that the other would then arrange. Shankar orchestrated "Ragas in Minor Scale" based on a theme Glass provided. Philip Glass has described Shankar as one of his teachers; it was through Shankar's music that the American composer came to realize that music could be constructed with rhythm as its very foundation — not necessarily on melody and harmony, as in the Western classical tradition. That realization became a cornerstone of Glass' own work. 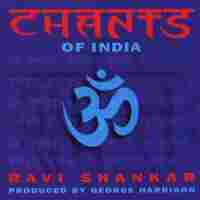 This is a very different kind of Ravi Shankar project, produced by George Harrison in 1997. Shankar took Hindu prayers, mantras and scriptural texts and framed them within larger musical settings, incorporating both Indian and European instruments along with voices. The results are transporting — and very beautiful.